©J.S. Peterson. USDA NRCS NPDC. UC Davis Arboretum, Davis, CA. February 4, 2002. Usage Guidelines. Seedlings show little seedbed preference, but they do best under an overstory or on the shaded overstory fringe. The best seedbed is moist soil covered with leaf litter. Few uncovered acorns germinate. Germination is hypogeal, and a short, cold stratification pretreatment helps to break dormancy. 1 acorn is sown sideways and pressed into media 0.5 times the diameter of seed to depth. 2Barbour, Michael G., and Jack Major, eds. 1977. Terrestrial vegetation of California. John Wiley and Sons, New York. 1002 p.
3Myatt, Rodney G. 1975. Geographical and ecological variation in Quercus chrysolepis. Thesis (Ph.D.), University of California, Davis. 220 p.
4Laidlaw-Holmes, Joanne M. 1981. Forest habitat types on metasedimentary soil of the South Fork Mountain region of California. Thesis (M.S. ), Humboldt State University, Arcata, CA. 47 p.
5Mize, Carl W. 1973. Vegetation types of lower elevation forests in the Klamath Region, California. Thesis (M.S. ), Humboldt State University, Arcata, CA. 48 p.
6Simpson, Lloyd G. 1980. Forest types on ultramafic parent materials of the southern Siskiyou Mountains in the Klamath region of California. Thesis (M.S. ), Humboldt State University, Arcata, CA. 74 p.
7Young, Betty. 2001. Propagation protocol for production of container Quercus chrysolepis Liebm. plants (Deepot 40); Golden Gate National Parks, San Francisco, California. In: Native Plant Network. 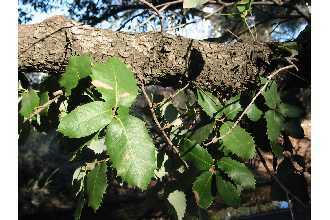 URL: http://www.nativeplantnetwork.org (accessed 6 May 2006). Moscow (ID): University of Idaho, College of Natural Resources, Forest Research Nursery. 8Verner, Jared, and Allan S. Boss, tech. coords. 1980. California wildlife and their habitats: Western Sierra Nevada. USDA Forest Service, General Technical Report PSW-37. Pacific Southwest Forest and Range Experiment Station, Berkeley, CA. 439 p.